Apart from doing the rear wiper mod covered in another thread, I also sorted out the wiring for the intermittent front wipers. This information is all already in the tech archive but it's a bit spread out and so I've created this diagram which will hopefully allow anyone with an ounce of electrical knowledge to put the wiring together quickly and easily. 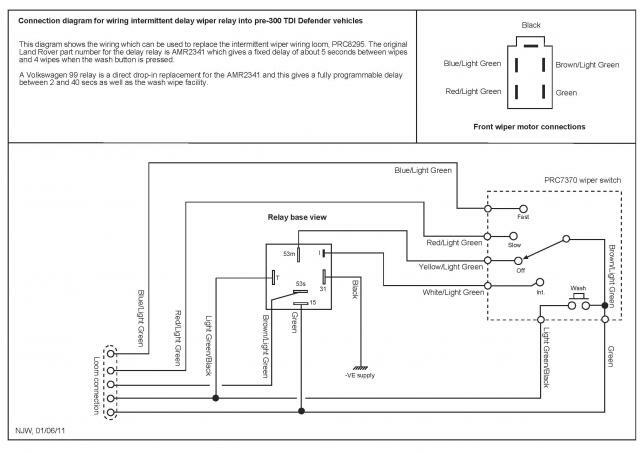 This diagram shows the wiring which can be used to replace the intermittent wiper wiring loom, PRC8295. The original Land Rover part number for the delay relay is AMR2341 which gives a fixed delay of about 5 seconds between wipes and 4 wipes when the wash button is pressed. A Volkswagen 99 relay is a direct drop-in replacement for the AMR2341 and this gives a fully programmable delay between 2 and 40 secs as well as the wash wipe facility. I made my own harness up when I found PRC8295 was no-longer available and it worked perfectly but I spoke to Autosparks to see if they would include it in their list and thay have now added it, I ordered one a couple of months ago to replace my DIY one and it is fine (I wanted the relay block instead of separate spade connectors I was using). I posted this on the earlier intermitant wiper thread including the Autosparks part number. Hello, thank you for this topic. I came from a french land rover forum, to solve a front wipers problème on a defender. I noticed an error on the original diagram on the principle of slow speed and fast speed. 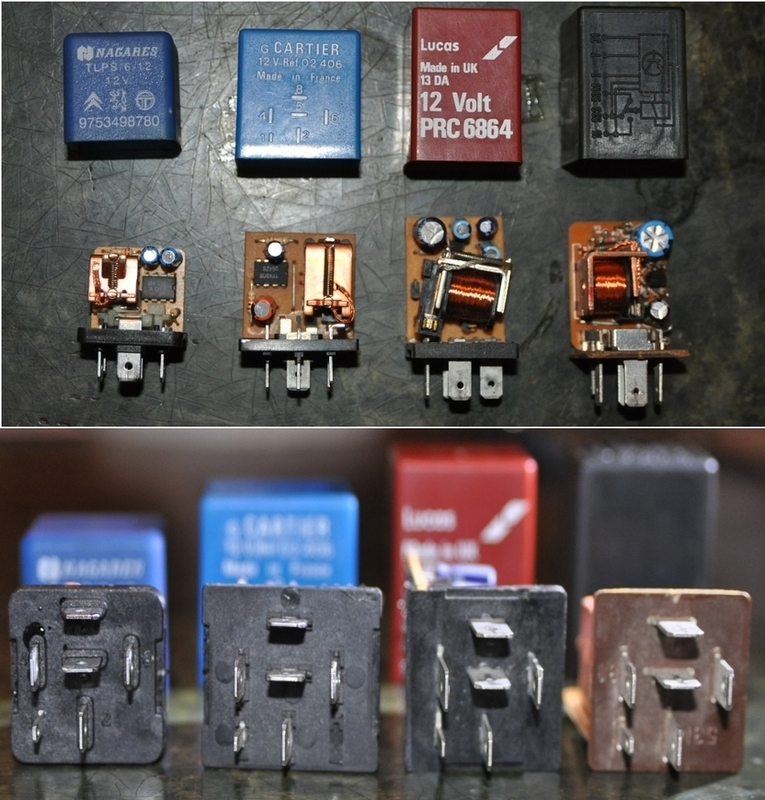 The color of the wires is reversed, do you agree with that ? While the diagram of nick williams is perfectly right and corresponds well to the observed operation. On the other hand is that there exists the "flick wipe" function mentioned in the diagram of the PRC7370 ? If you use a VW 99 relay, a quick push on the end of the stalk gives a single flick wipe, holding it gives you wash / wipe. OK, it's mean, that there are more or less false plans since the 300tdi up to the last TD4, because the flick position appears on every symbol. Also what do you think about the colors of the 12V wire on the pin number 6 of C0278, I have never seen a WG colors I have allway see a NG colors. Do you know why ? I did the same as Mo, much less hassle. Yes, it's depends on the duration of the impulse ordered by the pin T. You can also use other time delay relay instade of AMR2341 such as them show in the picture they all work in land rover. From left to right:NAGARES (Citroën, Peugeot, Talbot) ; CARTIER (Peugeot); LUCAS (Land Rover); SIEMENS (VW et Audi) . If you have a doubt on the time delay relay, you can replace it by a shunt, so you keep both speed and the automatic return. 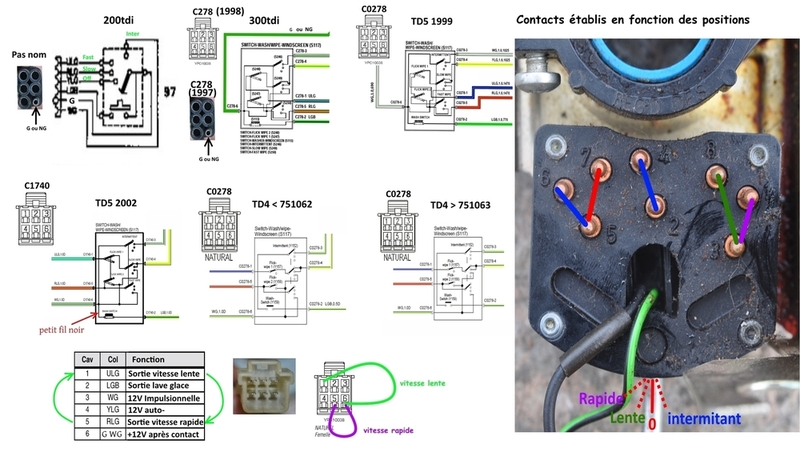 So you keep the connection between 53M and 53s as it show on the diagram on the VW relay. But, my truths question is: why, there is an error on the colors of the speeds wires, during more than 20 years? And are You all right with this diagnose ? Looking at doing this mod to my 1986 90. Currently only has 2 speed wipers with push down once wipe (which doesn't work any more). Does the PRC 7370 stalk switch fit onto an older 90 steering column? The wiring I'm quite capable of (I'm an aircraft electrician) just not sure whether to order one of those stalk switches or use a separate intermittent switch. Yes stalk is a direct replacement. My 110 is a 1989 model, this was a direct swap. Thanks guy, I'll just buy a new stalk then. bit easier. not quite a direct swap. The matching wires in the loom don't match the same positions on the new switch connector. So I've had to modify the new switch so that they do. Gonna plug it all in tomorrow and we'll see what happens this time.